Vineyards situation : Made with 100% Gamay grapes, our « cuvée » comes mainly comes from the Rhône and Saône-et-Loire region (Lantigné, Lancié and Régnié) : the very best location for Beaujolais Villages. Characteristics : The terroir is composed of granite as well as clay and calcareous. Among the 55.000 acres (22.000 hectares) of vineyards planted in the Beaujolais region, about 15.000 acres (6.000 hectares) are under the name Beaujolais Villages « Appellation d'Origine Contrôlée » which is the intermediary appellation between the Beaujolais and the 10 Crus. 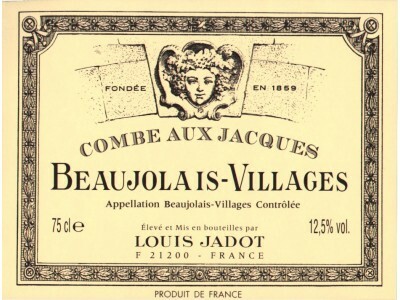 Wine making : The Beaujolais Villages "Combe aux Jacques" is vinified the same as the other wines from the region: with a semi carbonic maceration. Our Beaujolais Villages yield comes from three sources. One portion of our wine comes from the Régnié cru, another portion we purchase from quality winemaker, and the last is a portion we purchase grapes for and we vinify them ourselves in our winery in the south of Beaujolais. Louis Jadot is the only negociant buying grapes and vinifiying them independently. Winemaker's comments / Gastronomy : The long maceration will allow a good extraction. The wine will have a good structure and will therefore be able to age several years. This Beaujolais Villages "Combe aux Jacques" must be drunk quite cool in order to protect the delicious aromas of fruit and the delicate freshness that characterize this wine. Ideal with delicatessen and Italian foods. Preservation : This Beaujolais Villages can be enjoyed young or kept 2 or 3 years.